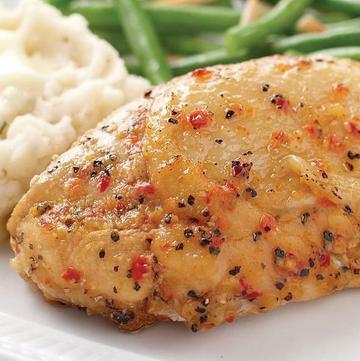 A special seasoning blend makes these oven-roasted chicken breasts exceptionally tasty. We have Paired them with your favorite side dishes for a delicious, well-balanced meal that's quick and easy. Fully cooked you can serve these cold atop a crisp salad or heat and serve as a main entree or on a sandwich. Creamy mashed potatoes and crisp green beans complete this fast and easy dinner. Meal serves 4. ​Do Not Thaw! Microwave: Remove chicken breast from bag. Place one chicken breast in microwave safe dish. Cover with paper towel. Heat on HIGH for 2 - 2� minutes. Oven: Preheat oven to 400�F. Place desired number of chicken breasts on foil lined baking sheet. Heat for 12-15 minutes. FROM THAWED: Thaw and Serve: Chicken breasts may be thawed in the refrigerator. Slice and serve cold. Oven: Preheat oven to 400�F. Place desired number of chicken breasts on foil-lined baking sheet. Heat for 8-10 minutes. Microwave: Remove chicken breast from bag. Place chicken breast in microwave safe dish, cover with paper towel. Heat on high for 1 - 1 � minutes. Broil or Grill: To warm, preheat broiler or grill. Heat for approximately 3 minutes per side. Contact Grill: Grill for about 2� - 3 minutes.